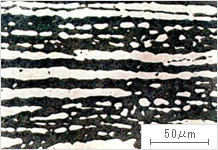 ･ Created from a mixed composition of austenite phase and ferrite phase. ･ Corrosion resistance in chlorinated environments and crevice corrosion resistance is superior. ･ Uses: corrosion resistant springs, ropes, fasteners, wire mesh, etc. * Information on wire diameters/treatments are provided on request.